What Would Mike Do? 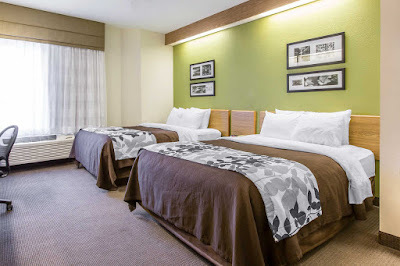 : The hotel blog: Hotels for sale: Sleep Inn, Little River, S. C.
This property has an indoor-outdoor pool, a large meeting space, and a rather nice fitness room with decent equipment in it. Little River is in Horry County, South Carolina (that's not such a funny name for a county if you know how to say it right; it's 'orry County, the h is silent . . .), on U. S. 17 and the Intercoastal Waterway, on the North Carolina border. Little River is essentially a submarket of Myrtle Beach: like most resort towns, a challenging place to market a hotel, but we took this one on anyway as a creative outlet, to see what we could come up with for it. A couple of years ago, we attempted a market study for a friend who owns a somewhat challenging property in adjacent North Myrtle Beach, to test out some software that we had adapted to identify corporate and group demand generators. (At the conclusion of our assessments, where we tell you that you should consider acquiring a property in this town if you already have one in this town, that town, or another town . . . that database is where that comes from.) Where it got frustrating is that Myrtle Beach has very few corporate and group demand generators. Few companies in the database we've accumulated (even now, and this was from when it was new) have a branch location in Myrtle Beach, and nearly all of the top employers in the Myrtle Beach area are tourism-related. In the Myrtle Beach area, tourists are a commodity. And to those tourists, hotels are a commodity. Fortunately, Little River is a submarket within the Myrtle Beach market that offers a few niches, and opportunities for a definable market position, so here we're going to look at what we can do with those. This property's distance to Myrtle Beach draws criticism from some guests, but is a feature that is appreciated by others for just that reason; it's out-of-the-hustle-and-bustle and away from the occasional craziness of the main beach area. Boating is an attraction here. The Intercoastal Waterway runs alongside the town, and several marinas are present. And less than five miles away, just over the North Carolina border, is Calabash, the seafood capital of the world, which hosts an annual festival. The property is located adjacent to a golf course on the main traffic thoroughfare through Little River, and across the highway from two others. On the other corner of Horseshoe Road is a furniture and mattress store. Eating establishments involve a drive of just under a half mile south or; if you're up to walking it, a six-minute walk according to Google Maps. This property is easily visible from the main traffic thoroughfare, U. S. 17. The only barrier is a row of palmetto trees along the northeast border, which were probably planted intentionally and -- as South Carolina is the Palmetto State: the Sabal palmetto is the state tree -- are probably illegal to cut. I'd give it a coat of paint. There has to be a groundswell of people who are over it already with dark adobe colors and earthtones, just waiting for someone to make the first move and bring back white. Of course, my own personal taste could be a factor: I don't like mauve. But I don't think the ten-year-old fad with darker colors is going to last another five-year lifetime of the next paint job that goes on the exterior of this building. We also want to check PTAC units for possible replacement: musty rooms are frequently a source of TripAdvisor hits. These shouldn't have to be done all at once (a property that needs to replace all of them would never achieve a 4.0 bubble score), but some of them will have to go. Meanwhile, more attention should be given to keeping the filters changed and maintaining them. Several reviews note that the pillows are too small. We should consider applying the same standard that prevails at Comfort Suites for these -- six good-sized pillows for a queen bed, nine for a king, of varying softness. Current ownership and management is appreciated by many guests for their flexible policies on check-in and check-out times. On Sunday, you can check out as late as 6:00 p.m. for an extra $25.00. Perhaps we should consider keeping that, at least for a time (ultimately, we'd like to solve that 51% occupancy that makes it possible). Bad wi-fi might be worth getting recalcitrant with Choice Hotels -- and their required Ethostream provider -- over: this property has taken a couple of recent hits on TripAdvisor over that. If the property is charging for local calls -- as indicated by a few TripAdvisor reviews -- it needs to stop already. That's so 'sixties' . . . No hotel does that anymore: the Red Roof Inn chain even offers free nationwide long distance. Hotels can't use their phones as a revenue generator anymore. This property had a renovation in 2015, but it's possible they made a bad mistake not transitioning to a 100% non-smoking property at that time. I was never much of a believer in 100% non-smoking hotels myself, partly because I like to smoke, and partly because it increases the chances that a non-smoking guest will end up in a "non-smoking" room that's been smoked in -- when they first came out, people sneaking smokes in a room (often by doing it in the bathroom, thinking the blower would be adequate to vent it) were a frequent problem. I always felt, keep a few smoking rooms available, and you can get around a lot of that headache; and accommodate everyone, whether they smoke or not, and everyone's happy. But more recently, a USA Today article noted that even most smokers have pretty much made their peace with it, so maybe it's time to move along with the times. And many of this hotel's most bitter hits on TripAdvisor are a product of 'smoky' rooms. We'd probably transition to 100% non-smoking as we deep clean and renovate. And if renovations were completed, current TripAdvisor reviews note a few fresh dings that maintenance hasn't caught up with, so more renovation is necessary. Occasional housekeeping boo-boos occur here as well, but the biggest need for attention by any new management is loose recordkeeping and room inventory control on the front desk. A lot of hits come from bungled reservations (one for an entire group) and not properly recording rooms as occupied once rented or when a guest is moved into one from a different room (it goes over very badly with a guest when the room in which he is staying is rented to another guest who lets himself in with a key). Certain things are going to occur in marketing any hotel, but we want to focus on what will work in Little River generally, and at this property particularly. In Little River, you're going to have a market base that is much older, and more well-to-do, than your typical Grand Strand tourists; so that is the focus that you want your marketing to take.. This property is going to be very package-heavy if we get involved with it -- there just aren't that many corporate and group demand generators around Myrtle Beach, it's pretty much strictly a leisure travel market. At the very least, and starting out, we're going to have our three-day/four-day rate for the golfers and grandkids coming into town (that's a 12% discount for a committed stay of three or four nights -- a three-day rate can begin on a Sunday, Monday or Tuesday; a four-day rate can begin on any day of the week), and a seven-day rate (20% off, and that's not a weekly rate, it's a discount with a minimum length of stay). I don't want to hear it about how Choice's property management system, ChoiceAdvantage, can't set up something like that (the last time I tried to set one up at a Choice property, there were issues . . .). If ChoiceAdvantage can't set it up, Red Lion's systems can, and this property can be a Red Lion. Sleep Inns have done it before, and this one here in Little River doesn't so obviously look like a Sleep Inn. Then, we get creative with the packages. We're certainly open to negotiating golf packages with the current owners of the Harbour View course, and we're willing to look at a few others. Charter boats are a big business in Morehead City, N. C., where I grew up, and Little River has all of the ones that are in the Myrtle Beach area. Adding an outbuilding to the property with a walk-in freezer is something to consider. Two casino boats operate out of Little River, but we don't expect a whole lot of interaction with them. Their TripAdvisor reviews (they have a bubble score of 3.5, which for a hotel we'd make to mean "this property has problems but it's managing its problems"; and as for us, we don't like managing problems . . .) seem to be written by people we don't want writing our TripAdvisor reviews while they're feeling cranky and writing up a review about having to pay for the food twice on the boat, or getting seasick, or not being able to see much of anything from the boat once you travel offshore past the territorial waters. And the boats offer hotel packages for $68 to $78: I don't know what the net payable to the hotel per night would be on that, but even if it's the whole $68 to $78, it's certainly not something we're going to allow ourselves to be dependent upon, if we bother with it at all -- this property's current 51.1% occupancy notwithstanding. We're not that big on resort markets to begin with (the only reason we're bothering with Little River is because it has the potential to be something more), and some of the most absolutely worthless tourism-dominated hotel markets we've ever visited in person are Atlantic City (how many other places do you see rooms at a Courtyard by Marriott at $72.00 per night?) and Cherokee (any Hampton Inn or Holiday Inn Express that can't get a rate higher than that of a 30-year-old Baymont Inn is in "survival and maintenance" mode). Proximity to a casino is not a demand generator for hotels -- if anything, it's a counter-demand generator, a kiss of death, the casinos take away with their left hand what they give with their right. Yes, the casino draws a lot of tourists, but they also have an overbuilt hotel facility attached with plush rooms to rent to high rollers, and to rent cheaply to gamblers of more modest means, with enough left over to drive the rates down for all other hotels in the market where they're located. Clearly the operators of those casino boats have the takers among the competing Myrtle Beach hotels for rooms rented at under $75, without having had to invest in a 500-room hotel tower in which to put up 200 gamblers per night. We don't have a social or moral problem with gambling: we'll be happy to rent the players rooms for a fair price (and to be fair, we've noted that sometimes those hotel packages run a bit higher, by the way), and during the winter we may get desperate enough to rent a bunch of rooms at $78.00 or below, but as a general rule we want to try and get a better rate for our rooms. The Myrtle Beach area badly needs a more diverse economy: an area, especially one this heavily populated, that is so heavily dependent upon a single economic driver (in this case, tourism) cannot claim to have an altogether healthy economy, no matter how well you're raking it in on the tourism dollars. What if a hurricane hits and wipes out much of the area out for a few years? (People who've lived here for a long time may remember Hurricane Hugo: Charleston isn't that far away . . .) There goes your tourism, and the entire area economy, for the year or two it would take to repair the damage and rebuild. Military towns are the most commonly seen examples, and the ones I'm most familiar with (I grew up near a couple of them), but the economy of any city that's solely reliant on a single economic driver is vulnerable. Look at what Detroit has come to today because of its reliance, for years, solely on automobile manufacturing. If economic diversity is going to happen for the Myrtle Beach area (and we need to do better than Hooters Air), it's going to have to happen here in Little River. 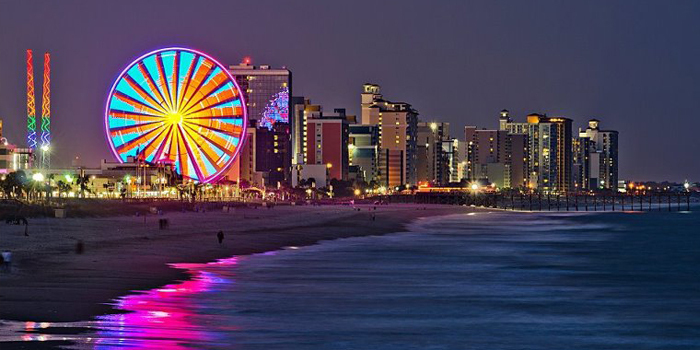 Here, you have the resources for it, the retirees, the capital, the skills that can be shared with younger entrepreneurs who'd like to live around Myrtle Beach. This hotel can be a force for that. We would seriously consider knocking out a few rooms to create the ultimate hotel business center; and we should deploy our meeting space and other resources to support the formation, locally, of a SCORE chapter. A utility vehicle -- a van or station wagon -- should be acquired and maintained to offer shuttle service to the Wilmington or Charleston airports, and to and from the local marinas and casino boat docks. We'd recommend keeping the Sleep Inn franchise here, if being a Sleep Inn is working out for this property. Make sure, however, that the five year termination options are in place. Go with it. The asking price is not unreasonable, and they may hold out for nearly all of it, but offer $3.75mil and see what they do. You do want to focus on your breakfast a little more. This property has taken a few hits for limited selection, items getting cooled over, and inadequate attention. I'd keep a breakfast hostess on duty on a daily basis here, and make sure I have my convection oven even if I have to knock out a room in order to enlarge the pantry and fit up a place to put it. Someone who had some skill and experience doing tourism-based marketing focused on leisure travel. 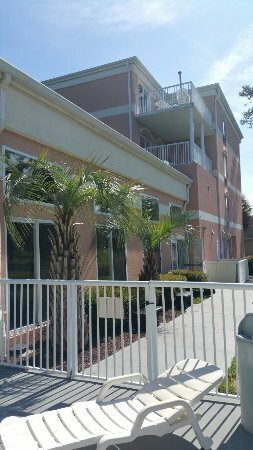 You should consider a Myrtle Beach area property if you currently own or operate a hotel in Atlanta, Winston-Salem, Raleigh or any other large city in the Carolinas, the Aberdeen-Southern Pines area, or one or more properties up and down the I-77 corridor through Ohio, West Virginia, and the Carolinas. This one is also something to consider if your current customer base is older, retired people who still like to travel, and are maybe looking for a retirement home in some resort spot down south. This property could be a Mom-and-Pop -- the thing to have for a retired couple with lots of contacts among older folks who'd like to have it as a vacation spot, just for an investment, something to do, and a way to make an easy living -- but marketing it is not going to be that easy. Leisure marketing isn't as tricky or difficult as marketing to business travelers, but it'll still require some work, and could be pretty draining on you if you're looking for an easy job just babysitting and managing a static hotel.